Many people use this climbing abbreviation, which seems innocent, but it has a dual meaning that is actually a racial slur. Many people use an abbreviated slang word in climbing without consideration or afterthought. This word is frequently used alongside other words like rope, harness, and belay. If you search on the Internet for this word, the first 5-10 results would reference the term to describe a piece of standard climbing gear. Countless climbing websites recognize the slang word as a standard, and our basic climbing students are even indoctrinated with its common use. And all of us are wrong. The word I'm referring to is "biner," which is a shortened or slang term for carabiner. What many people don't realize is that this word is actually a racial slur which holds a dual meaning. The "biner" slang word for carabiner can be offensive to people of Mexican descent and heritage. While the spelling of the climbing slang term and racial slur are different, they are audibly identical. It's common for people to use the climbing slang term, but I'd like to challenge us, as a club and a greater community, to boldly and proudly set the example for others to follow: let's stop using the slang word "biner" and abolish it from the climbing dictionary. 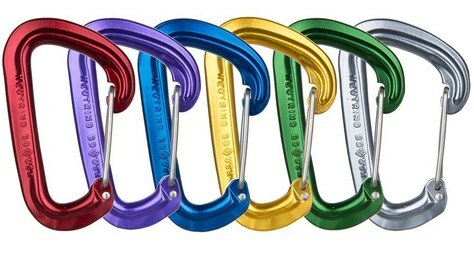 Instead let's embrace the use of the full word: carabiner! REI has published a glossary of climbing terms for your reference, which clearly calls for not using this slang term. And, for additional reading on the importance of language and how other words can be interpreted, please read the fantastic blog post on language and inclusion, Pickets, Peaks, Prusicks, and... Pronouns?, by Steve McClure and Steve Smith. Stacy Sarver also contributed to this blog post. Editor's Note April 2, 2019: When editing this piece, we mistakenly changed the word "Mexican" to "Latinx" in the second paragraph. We have edited the text back to the author's original wording above. We apologize for the error. Thanks for writing this blog post, Don. I taught climbing in Southern California from 2000-2002. One of the first things we learned in staff training was to stop referring to carabiners as ‘biners because it is a racial slur in other contexts (that was almost 20 years ago!). I had never heard this before, but all of us took it to heart – not because we were afraid of offending someone else, but because we wanted to be compassionate leaders. Honestly, it took like a week to eradicate it from my vocabulary. Retraining my brain to add back in two syllables was a really easy lift, relative to pretty much everything else in life. Certainly easier than overcoming years of being the target of hateful language. Adding two syllables was easy and had no negative impact on my life or my climbing. So even if just one person had the opportunity to climb without resurfacing social trauma because I changed my language, then that’s a good thing. I think when leaders take easy, thoughtful steps out of compassion for their students – that’s true leadership. Why does being compassionate push your limit? I thought "biner" was always pronounced "byner". Hispanic scrambler and climber here, saying that I would prefer we move away from the word. Saying "Locker" "Non-locker" and "Carabiner" are great alternatives. I've tested the switch myself and can promise you it has no bearing on fun or safety. Becca Polglase's post is great. Thank you for writing about this, Don. I didn't know the other potential meaning of "biner," but now I do and I will try to not use it any more. Even if it does not affect me personally, it affects others around me and it's an easy change to make.